Pupils at a burnt-out school are to return to temporary classrooms on the site by early autumn, the head teacher says. 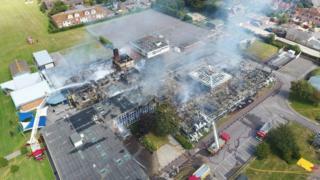 Selsey Academy suffered extensive damage and much of its contents were destroyed in the blaze on Sunday. More than 75 firefighters tackled the fire as huge plumes of black smoke spread across the West Sussex town. Meanwhile the 453 pupils will be taught at four locations in the Selsey area. The school also said the start of term had been delayed until 12 September. Head teacher Tom Garfield, writing to parents, said: "I am sorry for any difficulty these arrangements will cause, but the extra time is essential to allow staff extra time to prepare to teach in these new surroundings."